What goes on at coven meetings? How do Witches perform magic? Why does magic work? From initiation rites to invoking elementals, González-Wippler explains both practical and spiritual aspects of Wiccan traditions. Wicca is essentially a religion, as sacred and vital as other religions. Its central foundation is nature and all of its laws. Witches maintain a constant identification with the flora, fauna, the waters, the winds, and all other natural phenomena. Yet Wiccan beliefs and practices are often unknown or misunderstood by non-Pagans and the uninitiated. 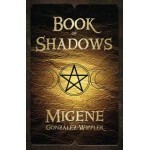 Approaching the Craft from the Gardnerian perspective, Migene González-Wippler offers a friendly, straightforward introduction to the Old Religion and sheds light on what it truly means to be a Witch. What goes on at coven meetings? How do Witches perform magic? Why does magic work? From initiation rites to invoking elementals, González-Wippler explains both practical and spiritual aspects of Wiccan traditions. Book of Shadows also teaches the significance of Moon phases, herbs, colors, crystals, common magical tools, and other implements when performing sacred ceremonies and rituals. Item Number: LL-9780738702131 | Approximate Size (Inches): 0.00 wide x 0.00 deep x 0.00 high | Approximate Shipping Weight: 0.50 lbs.